STARDOM allows users to pack and encapsulate the extensive know-how that system integrators have gained into reusable software parts. The Yokogawa Group has drawn on decades of expertise in configuring monitoring and control functions in the realms of process and factory automation to build libraries of extremely useful software parts available as Application Portfolios, and users themselves can package more advanced functions into a portfolio. Application Portfolios thus drastically improve engineering efficiency. The engineering phase holds the largest ratios in control system configuration in terms of both time and money, so improving engineering efficiency is one of the biggest issues when it comes to system integration. In the STARDOM, Application Portfolios (APPF) are devised to dramatically slash engineering costs and increase software reliability. Application Portfolios are libraries of software parts into which application expertise are packaged and commercialized, and that are run on STARDOM's components such as an FCN (field control node) or FCJ (field control junction) autonomous controller and VDS versatile database server software. STARDOM not merely offers Application Portfolios as off-the-shelf products but also incorporates a means for users to create their own portfolios so that parts can be added easily during engineering so as to boost operating efficiency. Application Portfolios comprise commercialized software parts into which Yokogawa Group's decades of know-how in control algorithms and control system operations are incorporated. Use of Application Portfolios not only raises engineering efficiency but also upgrades the integration quality since verified functions are reused. This paper introduces the technologies corroborating Application Portfolios. Application Portfolios are sets of various components. Typically, a group of function blocks running on an FCN or FCJ, such as a PID controller, and the corresponding object viewer for a human-machine interface (HMI), such as an instrument faceplate, come with an application example, as shown in Figure 1. Engineers can choose the language from these in accordance with the nature of the application they develop. Besides, groups of function units (FUs) in which algorithms are individually packaged, and which are also referred to as program organization units (POUs), as well as function blocks (FBs) in which groups of algorithms and related data are packaged, can be used freely as software parts in each language, thus making programming more efficient. IEC61131-3 stipulates languages suitable for object-oriented software engineering. Hence, taking advantage of this benefit to structure the software as hierarchically assembled modules will configure application software with high maintainability. Logic Designer provides a wealth of generally useful software parts in the forms of FUs and FBs, which make the logic coding work simpler. For example, FUs include an adder, absolute value extractor, and square root extractor, and FBs include timers and counters. In addition, Yokogawa Group's control know-how is provided in the forms of FUs or FBs. These parts and their examples of use were gathered and packaged as Application Portfolios that is the products independent of the standard software for the FCN and FCJ controllers. Besides, Logic Designer has a function to allow users to add FUs and FBs that they developed to standard parts with ease. 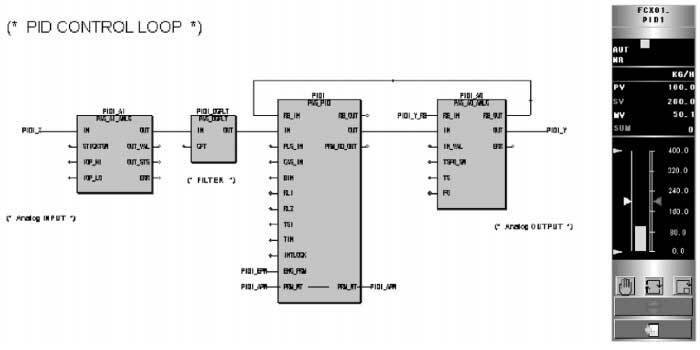 IEC61131-3 stipulates that users should bear the modularization of functions into FUs and FBs in mind at all times and effectively reuse those created FUs and FBs to improve engineering efficiency. An arrangement to protect the logic of each FU or FB with a password and hide the logic using an engineering tool is provided. This is of value to system integrators when commercializing application know-how since it allows FUs and FBs to be offered to users without disclosing the engineering know-how and the intellectual property rights of the know-how to be protected. Traditionally, when a firm sells the control know-how of its system integrators, it often offers a system configuration in which a dedicated controller or computer is intentionally provided for implementing only the algorithms and preventing detailed functions from being disclosed. While, the arrangement of encapsulation in the STARDOM enables the intended functions to be configured effortlessly using IEC61131-3-compliant languages, and then those functions to be encapsulated as software parts inside a controller with their internal details hidden. Namely, users are given the same platform in which both encapsulated parts and those portions of an application that need not be hidden can be handled to configure a system. Each Application Portfolio not merely contains control logic parts but also the parts for the operation and monitoring functions specifically required for its applications. For example, the faceplate of a PID controller is the operation and monitoring part corresponding to a PID controller block in process control applications. In addition to these parts, a program is underway to develop an Application Portfolio offering power demand display graphics that are generally used to monitor power consumption. Use of each Application Portfolio can be prohibited without purchase of the corresponding license based on the idea that system integrators/developers should be properly recompensed for the supply of components containing their value-added application know-how and that the intellectual property rights be protected. To prevent the use of an illegal copy, Application Portfolios, and FBs and FUs copied from them are designed to be able to run only on VDS, FCNs, and FCJs in which the respective license keys are installed. Some portfolios offered for the STARDOM are shown below. PAS (short for process automation system) Portfolio is a library of functions carefully chosen from distributed control systems' functions that are regarded as being required frequently in the new paradigm market for which the STARDOM targets. PAS Portfolio contains pairs of FBs and their corresponding faceplates. Each FB is designed so that its process data, data statuses, range, engineering unit, and other related data can be handled as a group of data, the wiring accomplished simply; and data tracking and bumpless mode transfer achieved effortlessly. The faceplates are designed to actualize the operability equivalent to that of traditional HMIs also on Web. SAMA Portfolio is a library of FBs compliant with the control diagramming symbols of the Scientific Apparatus Makers Association (SAMA) often used in power processes. Where the expressions of SAMA and IEC61131-3 differ, SAMA's expressions are used as far as possible. Each FB has simple functionality so that the control logic is explicit from the resulted diagrams. Although SAMA logic defines only internal calculations and thus requires no instrument faceplate, indicators of PAS Portfolio or the like should be used together when configuring a total system with operation and monitoring interfaces. Although users can flexibly configure control logic by assembling the standard FUs and FBs provided with Logic Designer and those in PAS Portfolio, General-purpose Portfolio provides FBs that are not contained in PAS Portfolio but are useful for general purposes. Such FBs include regulatory control FBs such as high-low range switching and cross-limit blocks as well as sequence control FBs such as resource scheduler and batch set blocks. To simplify the engineering for a sequence control application, which is generally complicated, each FB in General- purpose Portfolio comes with samples of control logic and graphics. Users can copy selected samples and modify them as necessary, thus making engineering much simpler. STARDOM allows controllers and I/O devices other than FCNs and FCJs, such as programmable logic controllers, to be connected on a control LAN of 10- or 100-Mbps Ethernet, and data in those controllers and devices to be monitored and operated using VDS. However, for further reliability, interlock and other critical signals need to be accessed directly between FCNs, FCJs, and other controllers and devices without the mediation of a personal computer. For this, bundles of FBs for an FCN and FCJ to directly communicate with programmable logic controllers via Ethernet are prepared as communication portfolios. At present, two communication portfolios are offered for popular programmable controllers: one for Yokogawa FA-M3 and one for Mitsubishi MELSEC-A. To allow supported controller models to be increased, these portfolios are devised so that the intended model can be connected simply by coding the required protocol in an IEC61131-3 application. Application-specific portfolios are libraries of FBs having application-specific control functions tailored to a specific process or equipment. Currently, two application-specific portfolios are offered: one for boiler control applications and one for boiler auxiliary control applications. Application Portfolios currently offered are predominated by the parts embodying the know-how for applications on which Yokogawa leads the industry; nevertheless, we will gather more expertise from wider ranges of applications to enrich this lineup. We believe it especially important to add an assortment of portfolios offering functions for factory automation other than those DCS functions for process automation as well as network- related functions using Java.